We are just a few short weeks away from the beginning of the Fun Run season. 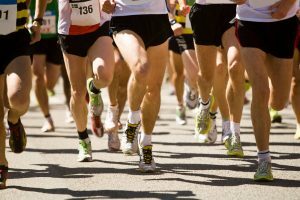 Those of you who are thinking of running the September Marathon should hopefully be starting to test your legs and begin training for the 42km event. Start your preparation early. Building up your distances too quickly can lead to injury. If you’ve had issues with your body or your fitness in the past it’s important to see a physio early in your training to try and iron out any kinks that might impact your performance such as poor technique, tight muscles, alignment issues and weak areas. Move more frequently. Just because you have a 10km run planned for the morning/evening doesn’t mean you can forego all movement throughout the day. Your muscles contract as you move which helps your heart to pump blood around your body. If you’re sedentary (sitting or standing) still for long periods throughout your day, your heart has to work harder to pump blood around the body. Running on top of a sedentary lifestyle can cause excessive strain on the already stressed cardiovascular system. More trips to get water, bathroom breaks, stretching while working, standing and moving while on the phone where possible, walking meetings etc will do your heart and circulation wonders. Learn to stand and walk properly. Our bodies change to mirror the things we do the most. Standing and walking around with poor posture can have a huge impact on how your body tolerates the increased running load leading to more injuries and decreased performance. Breathe. Breathing properly not only increases the oxygenation to the muscles and brain giving you more energy, but it also decreases tension in the neck and shoulders. This helps decrease the activation of your stress response which is responsible for decreased performance (e.g. panic breathing) and a multitude of different pains (feet, knees, hips, back, pelvic floor, neck, arms to name a few!). Get shoes that fit. Your foot requires a thumb width of space in front of your big toe and space to move widthways. Loosening your laces as much as possible, and doing a heel lock at the top eyelets of your lacing to stop your ankle from falling out of your shoe, can make a huge improvement in foot function and therefore propulsion. You can try this by making the change on one side only – you might notice the calves and feet on the side that have been released feel more relaxed. The shoes you wear throughout the day can also have an impact on how your foot functions and adapts to the ground while you are running. There are plenty of ways to improve your performance without pounding the pavement. Please see your physio if you think any or all of these things apply to you. We are located in Lindfield, on Sydney's North Shore just a short walk from Lindfield Train Station. You can book your appointment online at a time that suits you.